Share It: Book Now: TVR# 5140. TAT# TA-098-526-2080-01. 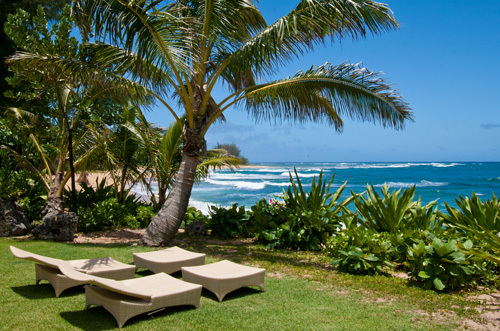 At the Banana Beach House on Kauai's tropical north shore you will enjoy a Hawaiian vacation of white sand beaches, coral reefs, sea turtles, waterfalls and a warm blue ocean. This new home is located on a stunning white sand cove with famous Tunnels Beach a short stroll away and some of Kauai's best shelling right out the back door. Tropical plants such as ginger, papaya and hibiscus surround the house and the fragrance of belladonna and jasmine fill the night air. The Banana Beach House design is Hawaiian Plantation Style with a light, open floor plan: including four bedrooms, 4.5 private baths, large kitchen, inside and outside dining, 4 covered lanais, quality entertainment centers, board games, book library, and two outside showers. Sleeping arrangements include two master suites with king beds, air conditioning, and walk-in showers. The kids have their own bunkroom which sleeps four on three plush daybeds and a trundle. The guestroom has a queen bed also with its own private bath. Casual elegance best describes the Banana Beach House. Cooks and families love the spacious kitchen which becomes a gathering place with its central island and breakfast bar. Two dining tables seat 8 each for eating inside or outside on the covered dining lanai. The main beachfront lanai provides chaise lounges for reading and dozing and captain chairs for watching the sea and clouds roll by. The Banana Beach House is a well loved and highly maintained home that offers a wonderful opportunity to experience Kauai's beautiful north shore. We are happy to provide details on all the hiking, snorkeling, shell gathering, surfing, shopping and sightseeing activities nearby. Our desire is to make your Kauai vacation something that you will always remember and hope that you will return to visit again. The Banana Beach House is a 3-minute drive to Tunnels, one of our finest seasonal snorkel and surf locations, and a few more minutes to "the end of the road" at Ke'e beach and the start of the breathtaking Kalalau Trail and the famed Napali coast. Princeville is 15 minutes from the house and offers golf, zip-lining tours, horseback riding, jungle waterfall kayak trips, shopping, and more. Six miles from the house, Hanalei has a variety of charming boutiques and services, including yoga and massage, as well as shops to rent kayaks, snorkel gear, or bikes. There is seasonal world class surfing as well. Standard Rate: Starts at $1,800/nt plus fees. “Wonderful Vacation Experience: We just enjoyed our second vacation in the past 3 years at the Banana Beach house. After our first trip with friends, we loved the house and the location so much, that we decided to share the experience with our extended family. We enjoyed hiking the Napali Trail, golfing at Princeville, exploring Queen's Bath, and just relaxing on the beach and the lanai. The house is comfortable, and it allowed us quality family time: cooking and eating together.